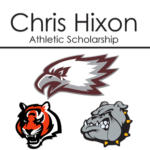 Christopher Hixon’s love for his student-athletes was well known. He always went the extra mile to ensure they were taken care of. To continue his legacy, we have created a scholarship in his name for student-athletes at the three schools he worked at.